I went to my first Lunches with Leaders function yesterday. This is a local event in Albuquerque, New Mexico put on monthly by the Young Professionals of Albuquerque (YPA). I’m not a member of the YPA but I got an email through my Linked-In subscriptions and decided to check it out. I attended with a few fellow Junior League ladies. We were ready to be inspired. The guest speaker was Sally Adams, a highly successful business woman in our community. She started out by downplaying her long list of achievements but she shouldn’t have. She is great. She has a very long history of giving back to her community and receiving numerous awards & accolades. One of the first things she told our audience was something to the tune of encouraging us to find a non-profit organization that we liked and to partner with them throughout our careers. Hopefully that message will stick with most of us. It always impresses me when people use their “celebrity” (or the influence they have within an industry) to help others in their community. Sally talked extensively about her life’s journey, which was humorous, scandalous, and entertaining. She even shed a few heartfelt tears when she spoke about her beloved daughter. She shared how she made many questionable or “failed” choices in her life. Though failed choices, she said she never regretted them because they were the choices that made her into the woman that she eventually became: knowledgeable, well-rounded, experienced, down-to-earth, compassionate, and relate-able. All of those experiences are what made her “real”, not just a list of awards on a piece of paper but something that created what she called the “fabric” of interpersonal relationships with others. Often times I go to business engagements and I never really get a sense of who someone really is or was along their journey. We never get to scratch beneath the surface of who these “successful” people really are. In my personal life, I enjoy people who are introspective and can be honest with others, but more importantly honest with themselves. I liked that Sally was willing to tell her colorful life story to a room full of strangers and not be fearful of judgment. It’s refreshing when people “own” who they are and the decisions they made along the way (good or bad). I think being comfortable in your own skin must just come with age. I don’t think there is any faster or easier route. She mentioned that she was 54. Today, I turned 34, and I have to say that I can’t wait until I feel so comfortable in my own skin too. 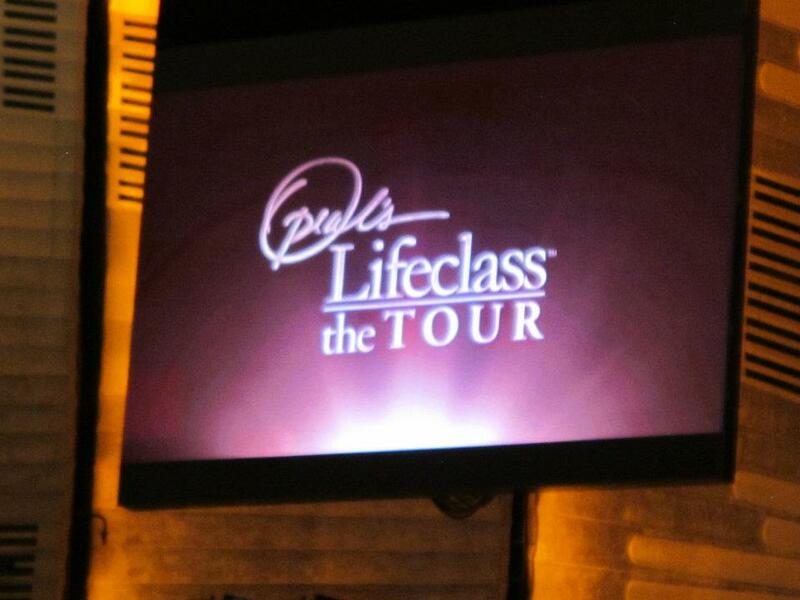 I received a message in my email saying that Oprah’s Lifeclass was going on tour and that tickets would be chosen at random the following day. I quickly found the page on their website and submitted my request for two tickets to the New York show taping with Deepak Chopra or Tony Robbins. But in all honestly, I figured it was just shot in the dark, some marketing scheme that would pick one in a million submissions. 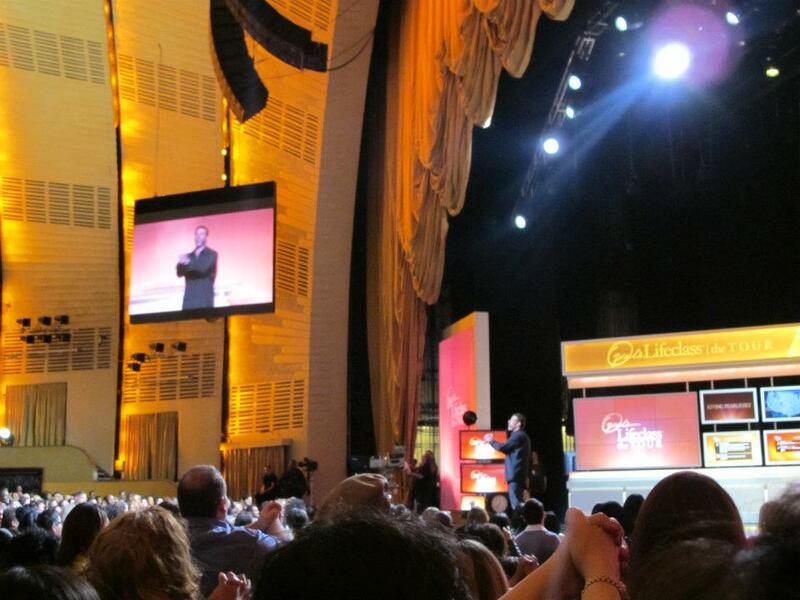 About a week later, I received an email stating that we had been selected for tickets to the Tony Robbins Lifeclass, the evening show on April 2, 2012 at Radio City Music Hall in New York City. I had to re-read the email over & over again to make sure it was true. I was in disbelief. 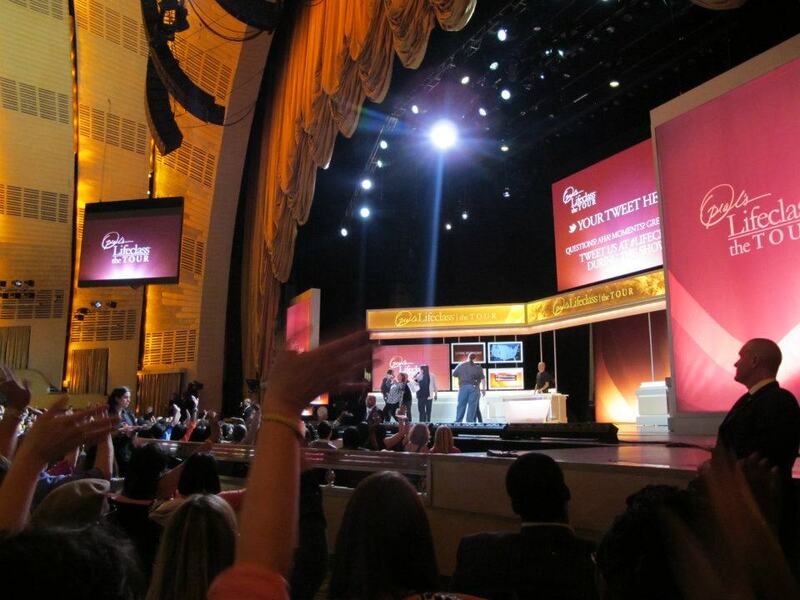 The Oprah Winfrey show had been on the air for 25 years and we had never been able to score a single audience ticket, we could rarely even get through on the phone line, and now, this email was stating that we had actually been chosen for tickets to her Lifeclass show in New York City. Part of me felt like I was on a hidden camera show and someone was going jump in front of me and say “Just Kidding, you’ve been PUNKED”…. The show was just over a month away. My heart fluttered with excitement. Who would I take with me as my guest? Afterall, we only had tickets to the show. The flight, hotel, and everything else would be at our own expense. Who would want to go? Who could go? 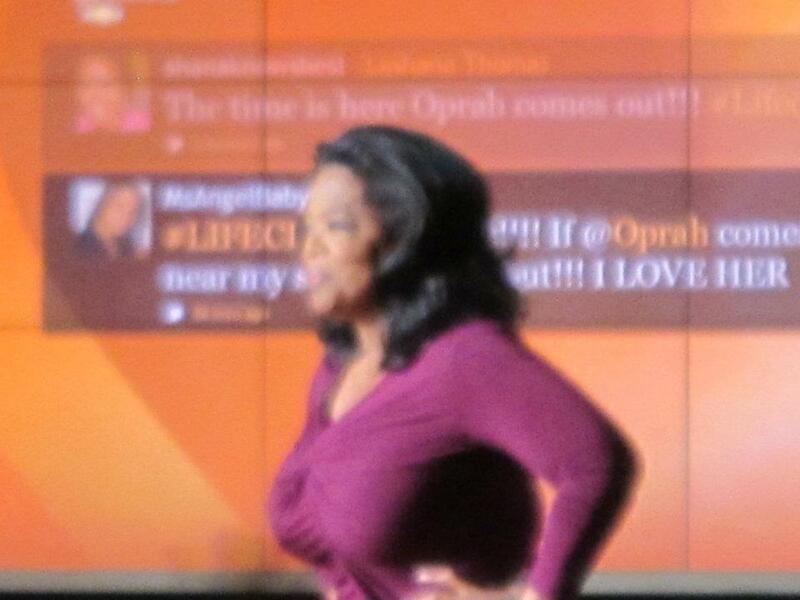 Who loved Oprah as much as I did? The first person that came to mind was my Mom, who I quickly ruled out because she was across the world teaching on the tiny island of Guam and she wouldn’t be available on such short notice. Then I thought of my twin sister. Yes, we were kinda “on the rocks” and not as close as we once were, but she was the only person who I thought might appreciate the experience as much as I would. When I asked her, she immediately said yes. I jumped up and down with sheer excitement, like a 6 year old who’s parents just told them they were going to DISNEYWORLD. 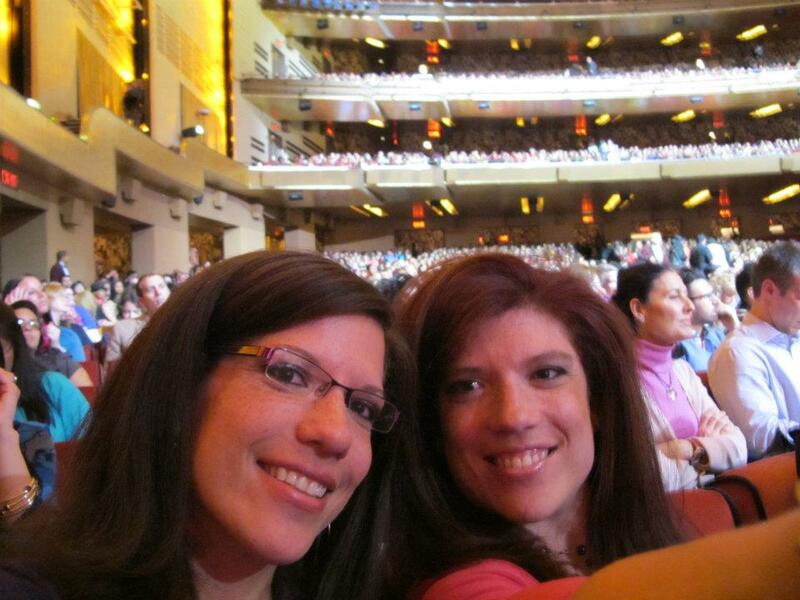 Not only was I going to see my idol, but I was going to have my twin sister along with me to share the experience. It was absolutely perfect. 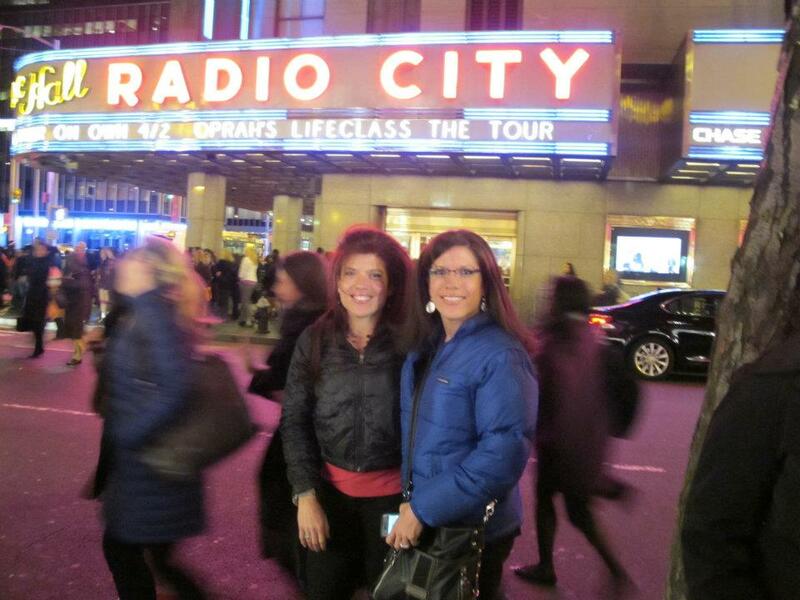 When we arrived at Radio City Music Hall on April 2nd for the evening show, the air was sparkling with excitement. Women were everywhere, ecstatic to be there, arm-in-arm with their best girlfriends or sisters, smiling ear to ear, and all dressed up. 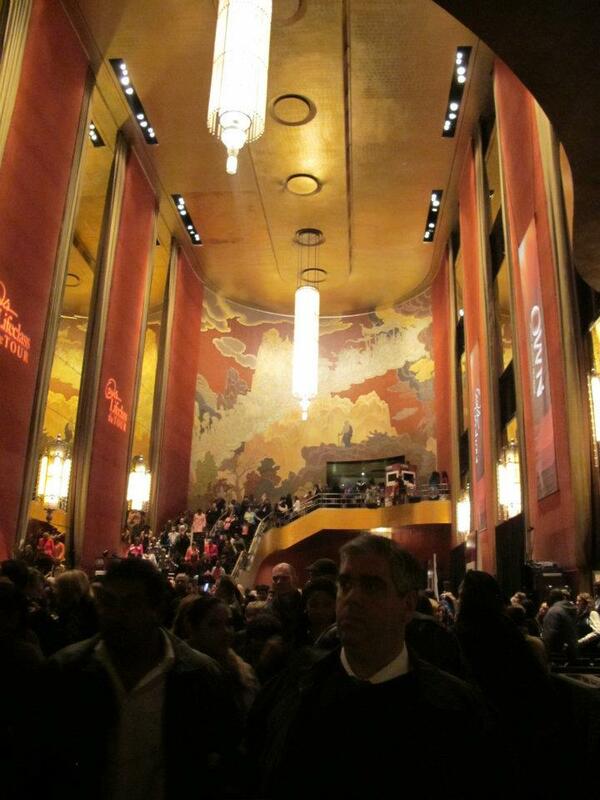 Photos were snapping nonstop, people were documenting their experience at every inch of the theatre. We were shown to our seats. We got pre-selected to sit in the very front section in the Orchestra seating area. It think it was because of our reply to an email of theirs inquiring about us. We told a story of our last experience together in New York City, being stuck in the power blackout of 2003. They either wanted to give us a better memory of NYC or they were rewarding us for flying all the way from Albuquerque, New Mexico. 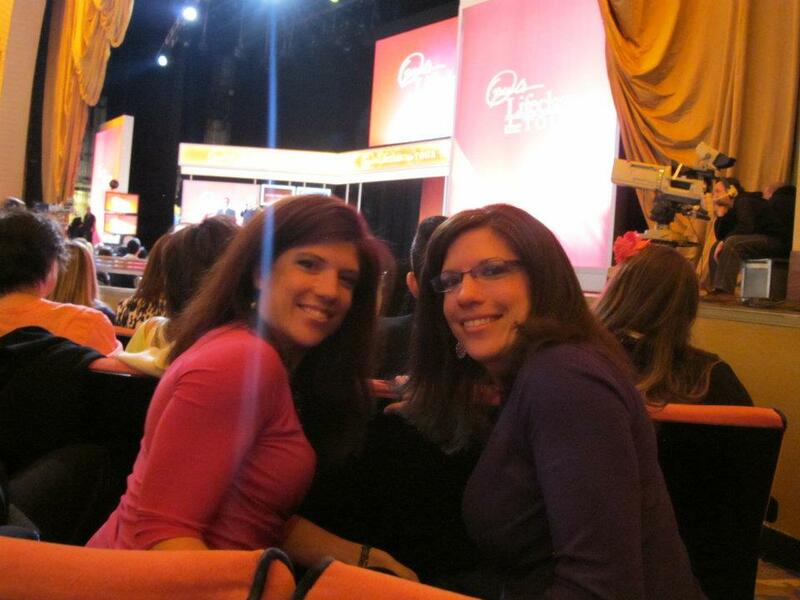 We were so grateful to be seated just a few rows away from the stage. 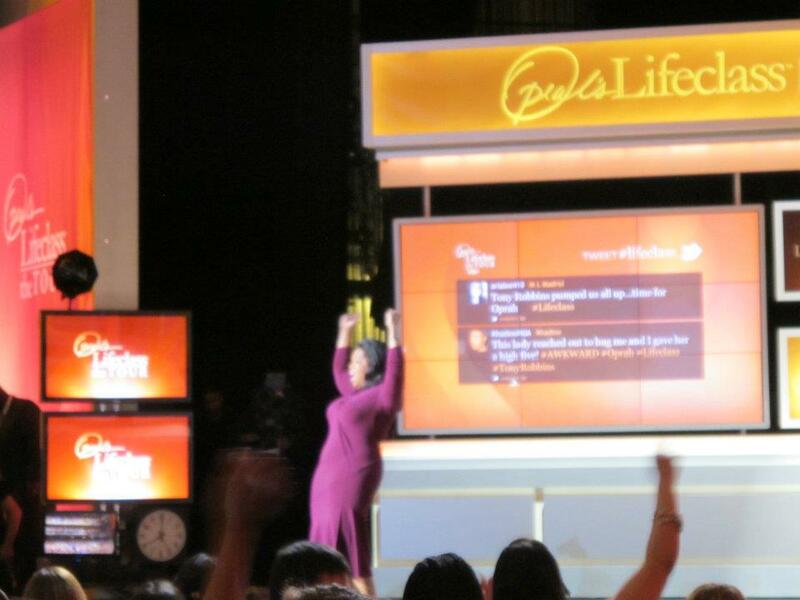 When Oprah walked out onto the stage it was like I wasn’t even there. It almost didn’t feel real. After her show on ABC had ended, I hadn’t seen her in several months, so seeing her felt like seeing an old friend, one whom I had religiously watched on TV practically every single day for as far back as I can remember. I could hardly notice the deafening cheering around me. It was like I was watching her on television. She had the same voice, the same smile, the same sense of humor, the same mannerisms. She was larger than life, yet her presence was calming & peaceful. Her face translated as love to me. It was familiar, genuine, full of light & love. She had a warmth about her, a positive energy that brought tears to my eyes. I felt so blessed to be in her presence. Everything that she has done in her life has been to help other people. Whether it be through her charitable organizations or though the work she does on her shows, she’s committed to success of humanity. Committed to help us grow, cope with, and overcome things. Help us become the best that we can be. Help us forgive others, and forgive ourselves. She’s a true humanitarian of our times, a modern day Mother Teresa. She may not be directly living amongst & feeding the poor but she sure could have taken all of her wealth & riches and ran off to live on her own private island decades ago. Yet, she didn’t. She chose to continue to use her life, her influence, her platform, to encourage & inspire others to find their own strength and their life’s ultimate destiny. She’s truly selfless, and a world class example of what true wealth is made of: The wealth inside of your heart & soul. She is my hero. She was so funny and real too. During a commercial break (it was being aired live on the OWN network), she joked about her high heels hurting her feet so she promptly took them off and gave them to a screaming fan in front row. She also joked around with the guest speaker, Tony Robbins. They were both really candid with each other. From where we were sitting, the sound was really echo’y. We thought that might have been from the way they had to have the speakers positioned for the live feed, so we had a hard time following the dialog at times. 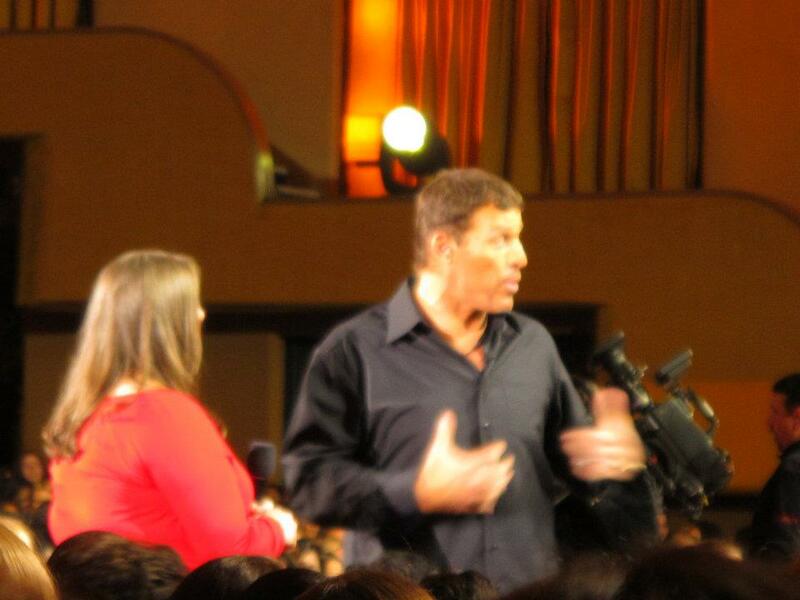 Tony Robbins’ loud booming voice really echoed alot so it was harder to understand him, distracting mostly. 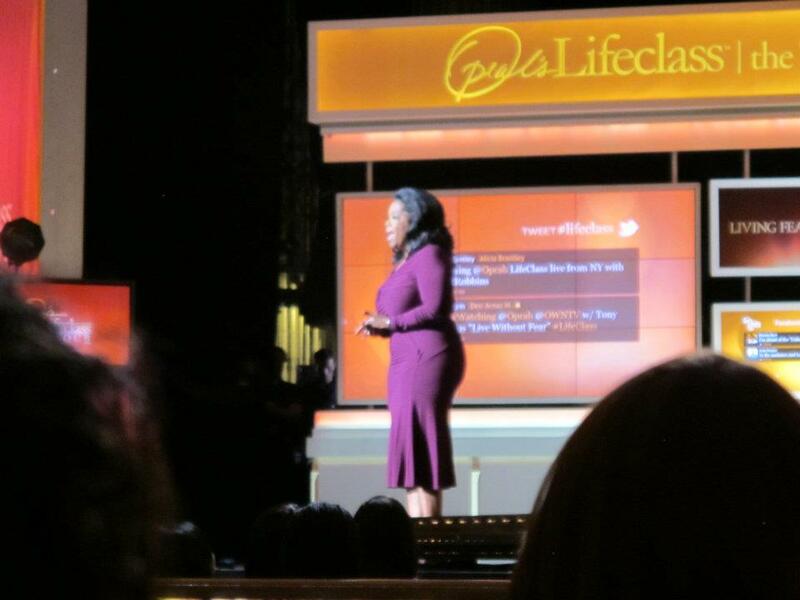 But we got what we needed to out of the Lifeclass: How to live fearlessly. Tony was such an enthusiastic and positive guy. Oprah spoke about how his support & encouragement prompted her to walk on firey hot coals, something she didn’t believe she could do. End the end, echo or not, you could have put me on a tiny boat in the middle of shark infested waters with Tony & Oprah and I would have felt so grateful for the experience of just being there to hear these great inspirational icons and absorb all the wisdom they had to share. Seeing an Oprah Winfrey show in person (and at world famous Radio City Music Hall in the heart of New York city no less) is now happily checked off of my Bucket List. Whew. 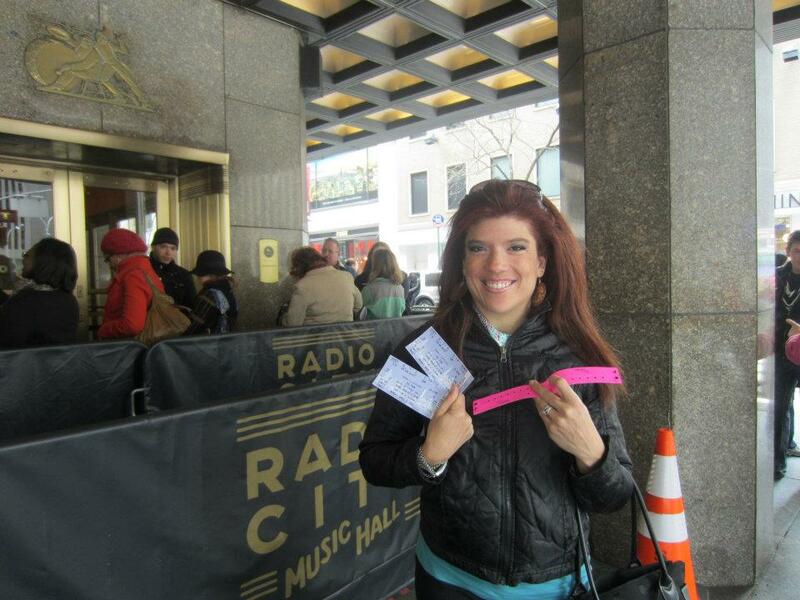 Picking up the tickets at Radio City Music Hall the day before. Last night I attended the wedding of our families long time friends son, Josh. My Mom & Josh’s Mom have been best friends since before we were born. I was the first born of my family, Josh is the 4th. He had 3 older sisters, all of whom got married in years (& months) prior. Josh’s parents are John & Diane Nevers. They are hard-working and traditional. John has worked as an engineer for as long as I can remember. Diane was a nurse but stopped working to raise her children. They are devout Christians and very involved in their church. Growing up, they invited us to every single church function: vacation bible school, october carnival, and all the special holiday functions. Sometimes we’d go, sometimes we wouldn’t. Being raised by my parents, both of which were never really religious on such a saturated level, we’d often wonder what the Nevers family “got out of” being so wrapped up in religion & the church. Throughout the years, after being raised Catholic, I had often struggled with my own spirituality & religious beliefs. At times, I’d felt insecure around the Nevers family in all their Godly glory. I perceived that they judged me & my life. I perceived that they were secretly shaking their heads at all of my imperfect decisions. But I’ve learned that that couldn’t be farther from the truth. Though we haven’t always been pillars of light, they’ve always treated my Mom & our family, like we’re a part of theirs. The Nevers family would give you the shirt off their back if you needed it. I’ve never heard them gossip or pass judgment on anyone. I’m convinced they are one of the last true wholesome families out there. John & Diane raised all 5 of their kids on a single income. And as far as I could tell, their kids never wanted for anything. They were content with hand-me-downs from older siblings or friends. Content with sharing bedrooms & bunkbeds. Content with keeping their old television, mini-van, computer, etc. until they burned out. Content without their kids having the latest & greatest video games, ipods, clothes, gadgets, fads, etc. In other words, content without having to keep up with the Jones’. They lived a simple life with simple by-laws. And it worked. They raised 5 wonderful kids. They are sweet, caring, loving, and wholesome. In fact, I have never heard them fight or bicker or say two mean words about anybody. They don’t care about wanting to “get ahead” or to find jobs making gobs of money. They just seem to have different goals & priorities. They seem to make the world a better place by just being in it. I may have felt insecure by their “simpleness” in the past. Speculated on their true joy in life. Questioned their achievements & contributions to this world… but I finally “get it”. And the truth is, now that I’m a parent, I want my children to be just like them. Sweet. Kind. Caring. Loving. Simple. Beautiful. I don’t want Gentry to be the popular jock in highschool who gets all the ladies, I want him to be the quiet nerd in the corner who is kind to people before anything else. Same with Haven, I want her to make the world a better place just by being in it. I know that I will have to let my kids be who they are going to be but if I can somehow be the influence like John & Diane have been to their kids, I want to be. I know it starts with becoming more spiritually rich myself & raising my kids to be too, and valuing ones neighbor and not possessions. It’s so hard in this society of mass materialism. It’s so hard not to lose focus of what the most important things are. I’m going to try my best. Being 69 years old, not having to go to work sounds like a blessing but it also almost sounds like means to an end. It means endless possibilities but it also means limited possibilities. No more work routine, no more co-workers, no more taking days off for vacation because your life is now an endless vacation and what is the next milestone to look forward to? a trip overseas? a retirement home in Florida? Death? So I CAN wait until I retire. Life happens now. The journey there is the prize. Something is missed when the eye is only on the goal ahead and not in the present moment. So I’m going to make the best of these next 35 years. I’m going to savor every single minute of it because I don’t want it to end.